The organizer of several excellent special programs on film noir at the Roxie in San Francisco, Don Malcolm, hosts films he calls Agitprop and says we can learn from especially given the political climate of today. (Part of the A Rare Noir is Good to Find series). Prior to the present administration where human rights are at stake films like these were relics from the past reminding us that social justice was abused by the discriminatory legislation and institutions that defied human rights. Racist and anti-Semitic vigilante groups that worked to meter out abuse is the subject of the film Open Secret, directed by John Reinhardt, a B film noir classic from 1948 starring John Ireland. A newly married couple Paul and Nancy Lester bunks down in the apartment of an old friend who never returns. They become embroiled in discovering there is a clandestine operation that seeks to snuff out Jews from the community and make their life difficult with constant harassment. Photographs taken by the old friend are incriminating evidence developed by a Jewish shopowner across the street and a roughhouse gang will do anything to get their hands on them. Nancy (Jane Randolph) can be counted on to scream at just the right moment, and Paul (John Ireland) is determined to get to the bottom of this. The claustrophobic set design has people living nose to nose with neighbors. There is also a nosey landlady Miss Trissdam (Anne O’Neal). It is interesting to note how the shady gang manages to keep hidden in a dark basement seated around a table making dastardly plans lead by Carter, played by versatile veteran character actor Arthur O'Connell. The crusaders of justice are the newlyweds, and Detective Sgt. Mike Frontelli played by Sheldon Leonard. Also in the program is an episode of the TV series from the early 60’s The Defenders, (1961) about a father and son law firm - Lawrence and Kenneth Preston- starring E.G. Marshall and Robert Reed. Reed has little to do in this trial where a physician Dr. Ernest Montgomery (Robert Simon) is in custody for performing illegal abortions. The women who are called as witnesses have either had abortions or were counseled against having them including the underage Sarah played by Kathleen Widdoes. Lawrence Preston as chief counsel for the defendant is an intelligent bold and shrewd lawyer whose case is heard by the sympathetic and humanitarian Judge Burton Henshaw (Judson Laire). The emphasis is on the young women who volunteer to be witnesses and speak on behalf of their doctor. Edward Dmytryk, who grew up in San Francisco made I in 194, the third film in this special series. Dymtryck was later blacklisted in Hollywood for refusing to cooperate with the House on Un-American Activities (HUAC), and was one of the Hollywood Ten. 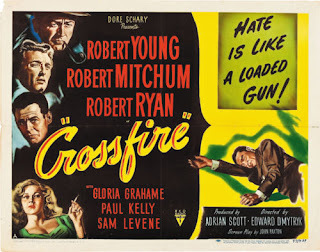 The film concerns the murder of a Jewish Man Joseph Samuels (Sam Levene), which is investigated by Detective Findlay (Robert Young). Findlay’s sleuthing leads him to a witness who is crucial for the defense played by Graham. Robert Mitchum plays Sergeant Kelley. The film is an important example of film noir because it brings into question whether noir is really noir if it has a message. 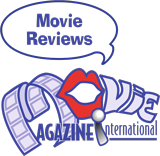 May 2 though 8 the Roxie Theater hosts more films from the A Rare Noir is Good to Find series and will be reviewed next week on Movie Magazine International.